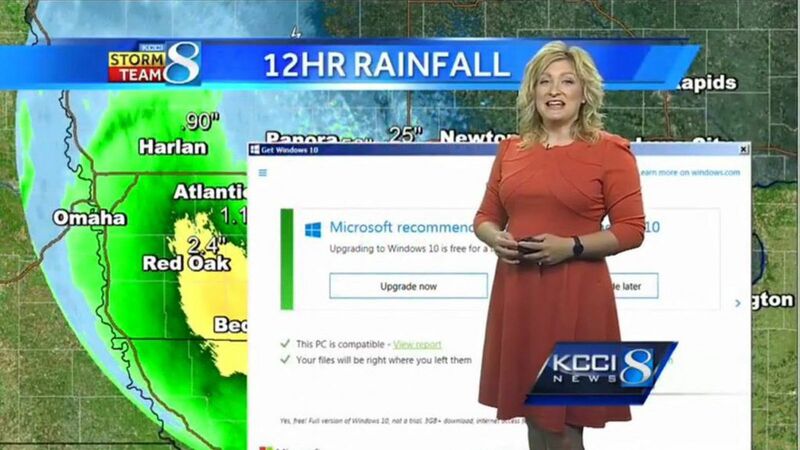 Meteorologist Metinka Slater was reporting the weather live at Iowa’s KCCI 8 News, doing her weather forecast, warning the residents the coming thunderstorms, when suddenly the Windows 10 update notice showed up to remind the computer owner to UPDATE!!! Luckily it was just a few second, and the staff behind the scenes had acted fast on the issue. Mentinka still managed to drop a joke for the unexpected situation without any panic, she said “Microsoft recommends upgrading to Windows 10. Gosh, what should I do?” she asked rhetorically while still reporting live. “Don’t you love when that pops up?” Apparently they just dismissed the message and left the computer non-updated. If you don’t wish the same thing happens to you in your important business presentation, act now! Upgrade to Windows 10 today!